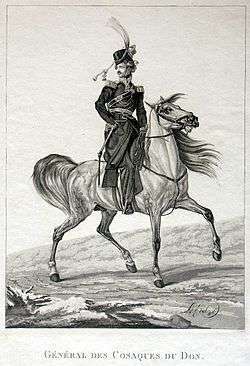 Don Cossacks (Russian: Донские казаки) are Cossacks who settled along the middle and lower Don. 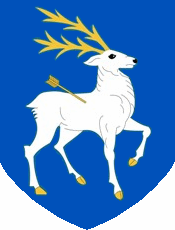 Historically, they have been located within what was the Don Cossack Host (Russian: Всевеликое Войско Донское, Vsevelikoye Voysko Donskoye), which was either an independent or an autonomous democratic republic in the present day Southern Russia and the Donbas region of Ukraine, from the end of the 16th century until 1918. As of 1992, by the presidential decree of the Russian Federation, Cossacks can be enrolled on a special register. A number of Cossack communities have been reconstituted to further the Cossack cultural traditions, including those of the Don Cossack Host. The exact origins of Cossacks are unknown. In modern view, Don Cossacks are descendants of Slavic people, who came from the Dnieper, Novgorod Republic, and Principality of Ryazan, and of Goths-Alans people originating from the Western part of North Caucasus. More than two thousand years ago the Scythians lived on the banks of the river Don. Many Scythian tombs have been found in this area. Subsequently the area was inhabited by the Khazars and the Polovtsians. The steppes of the Don River were called "The Wild Field" (Дикое Поле). The area was under the general control of the Golden Horde, and numerous Tatar armed groups roamed there, attacking Russian and foreign merchants. 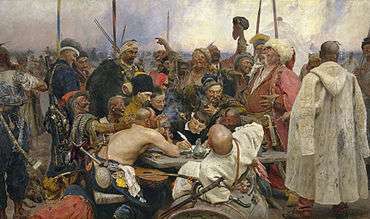 Cossacks of Ryazan are mentioned in 1444 as a defenders of Pereslavl-Zalessky against the units of Golden Horde and in a letter of Ivan III of Russia since 1502. After the Golden Horde fell in 1480, the area around the Don River was divided between the Crimean west side and the Nogai east side. On their border since the 14th century the vast steppe of the Don region was populated by those people who were not satisfied with the existing social order, by those who did not recognize the power of the land-owners, by runaway serfs, by those who longed for freedom. In the course of time they turned into a united community and were called "the Cossacks". At first the main occupation of these small armed detachments was hunting and fishing—as well as the constant struggle against the Turks and the Tatars who attacked them. Only later they began to settle and work on the land. The first records relating to the Cossack villages: the "stanitsa", date back to 1549. In the year 1552 Don Cossacks under the command of Ataman Susar Fedov joined the Army of Ivan the Terrible during the Siege of Kazan in 1552. On 2 June 1556 the Cossack regiment of Ataman Lyapun Filimonov, together with the Army of Moscovits comprising strelets, conquered and annexed the Astrakhan Khanate. Under Peter the Great and subsequent rulers, the Don Cossacks participated in numerous military campaigns, which resulted in the expansion of the Russian Empire from the Black Sea to the Baltic Sea. For years, the Cossacks waged war against the Ottomans and the Crimean Khanate. The Siege of Azov in 1641 was one of the key actions in Don Cossack history. After total taking of the Free Territories of Don Cossacks under the Moscovits control, Don Cossack history is totally intertwined with the history of the rest of Russia. In exchange for protection of the Southern borders of medieval Russia, the Don Cossacks were given the privilege of not paying taxes and the tsar's authority in Cossack lands was not as absolute as in other parts of Russia. After 1786, the territory of the Don Cossacks was officially called Don Voisko Lands, and was renamed Don Voisko Province (Russian: Oblast’ Voyska Donskogo) in 1870 (presently part of the Rostov, Volgograd, and Voronezh regions of the Russian Federation as well as part of the Luhansk region of Ukraine). Percentage of depopulation during the genocide of the Soviet famine of 1932-33. Formerly Don Cossack lands are on right. The pro-governmental Host divided in two different organisations. The Don Cossacks were revived in the early 1990s and were officially recognised by the Russian Federation Government in 1997. The Don Cossacks flag 3:4 was inaugurated during the Don Cossacks assembly in Novocherkassk, Don Republic, on 4 May 1918 under chiefing of Ataman Pyotr Krasnov. The flag has thee colours: blue, yellow, and red. The flag is similar to that of the Ukrainian State, also established in 1918, which the Don Republic bordered to its west. When a son was born to a Cossack family, his relatives presented him with an arrow, a bow, a cartridge, a bullet and a gun. All of these items were hung on the wall, over the boy's bed. At the age of three, the boy began to ride a horse. At the age of 7 to 8 he was allowed to ride in the street, to go fishing and hunt with grown-ups. The Don Cossack Choir Serge Jaroff was a group of former officers of the Russian Imperial Army who were discovered singing in Çilingir (near Constantinopel), where they had fled after the defeat of their army in the Crimea. They made their formal concert debut in Vienna in 1923, led by their founder, conductor and composer, Serge Jaroff. ↑ "Демоскоп Weekly - Приложение. Справочник статистических показателей.". Retrieved 23 April 2015. ↑ "В.О. Ключевский. Курс русской истории. Лекция 45". Retrieved 23 April 2015. ↑ Keyser, C.; Bouakaze, C.; Crubézy, E.; Nikolaev, V. G.; Montagnon, D.; Reis, T.; Ludes, B. (2009). "Ancient DNA provides new insights into the history of south Siberian Kurgan people". Human Genetics. 126 (3): 395–410. doi:10.1007/s00439-009-0683-0. PMID 19449030. ↑ "Городовые казаки". Retrieved 23 April 2015. ↑ "Новгородские казаки - Казачий Порядник. О.Данкир". Retrieved 23 April 2015. ↑ "Червленый Яр и рязанские казаки Воронеж". Retrieved 23 April 2015. ↑ "Talk Of Napoleon At St. Helena". Internet Archive. Retrieved 23 April 2015. ↑ "armymuseum.ru". Retrieved 23 April 2015. 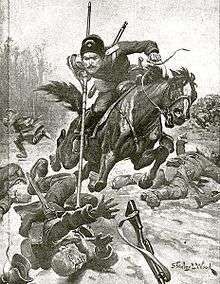 ↑ http://a-pesni.org/grvojna/bel/vskol1918.php Anthem of Don Cossacks in Russian Civil War. ↑ Minahan, James (2000). One Europe, Many Nations: A Historical Dictionary of European National Groups. Greenwood Press. p. 216. Retrieved 9 December 2013.